I know I haven’t really posted anything in a while. It’s been a rather busy time, of course. I hope everyone enjoyed their Thanksgiving and shopped responsibly on Black Friday. Things have been pretty busy for me, as far as the book series goes, and my own personal life. I’m preparing to undergo surgery on Wednesday (I tore my ACL playing football [prayers are not suggested, although they are recommended :P]), and I also have rehab every day. I actually could work on The Golden Lands while I do my rehab (which is basically just some simple stretching), but the exercises are too distracting, and my writing tends to lack very much emotion. So I’ve been reading! If anyone wants a nice, long fantasy novel to read, check out Mistborn by Brandon Sanderson. A friend recommended it to me…and dang. I mean dang. It’s a great series. And it keeps me in good, fictional company during my periods of rehab. What’s going on now that the first arc of The Golden Lands is finished? Well, revisions are being made to the presiding book covers, as promised, and I’m looking for literary agents for Volume 1. I’m also writing Soul Bleeder, a behind-the-scenes novella set in the world of The Golden Lands. And Volume 5 is also being written (just finished the first chapter yesterday!). Yes, that’s John, the main-character. This is a screen shot from the program I use to color all of our pictures. I believe this will be the most epic piece of artwork that Clare and I have created…I can’t wait for you to see it! So that is what’s up with me! Last Chance to Get Volume 4 for Free! Just another reminder that the sale on Volume 4, as well as Volumes 2 and 3, will be ending TOMORROW! You can download Volume 4 for free here or as a Nook Book, at iBooks, or Kobo. On Kindle, it’s 99 cents. The Golden Lands, one of the three worlds of Terra, is supposed to be a place of peace, light, and happiness. But the Golden Lands hasn’t exactly been such a place for John Hedekira, a jaded, hot-headed teenager. We come to a halt, stopping right beneath the wall which rises high above us. Thunderousbooms sound in the distance, and we can vaguely hear the clashing of weapons and the screams of pain. “So the fighting has already started,” says one of the scouts with us. So, what if you don’t know the original plot of The Golden Lands? Click here to read the prologue of Volume 1: Shadows in the Sunlight. Both Volumes 1 and 4 have been free for a long time now, and Volumes 2 and 3 have been discounted during that time as well. However, I believe it’s time to announce that the sale will be officially ending on Wednesday the 25th. Thus, now is your LAST CHANCE to download Volume 4 for free. 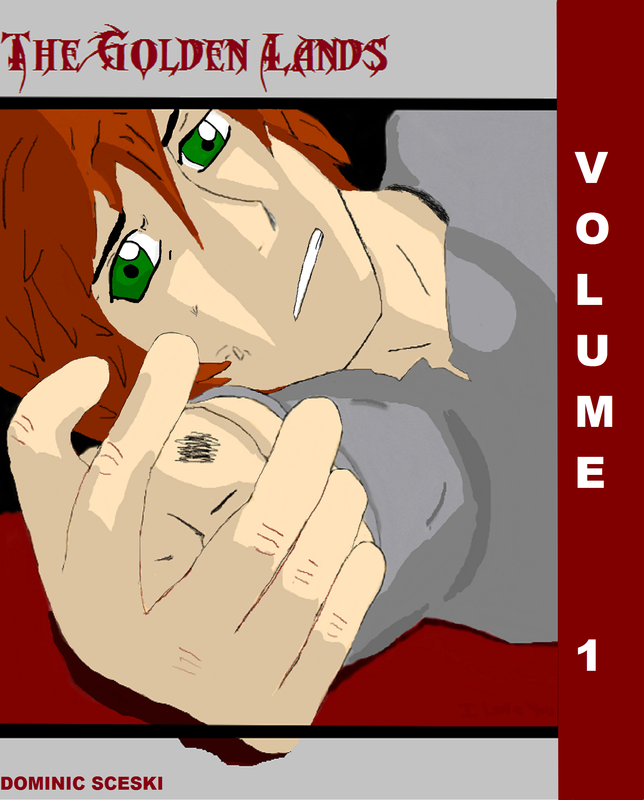 Volume 4, due to it’s length, will cost $2.99, and Volumes 2 and 3 will go back to being $2.00. Volume 1, as always, will remain free. Right now, the series, as a whole, costs $1.98 (0+$0.99+$0.99+0). You cannot ask for a better deal. My eBooks are available at barnesandnoble.com as Nook Books, on iBooks, Kobo, and here at Smashwords.com. The Golden Lands has gotten some great reviews so far. Why not find out for yourself why people are talking? The Golden Lands, one of the three worlds of Terra, is supposed to be a place of peace, light, and happiness. But the Golden Lands hasn’t exactly been such a place for John Hedekira, a jaded, hot-headed teenager. His parents disappear when he is thirteen, and he’s left to look after his younger sister and brother. One evening, John decides that he has had it with the distant, self-pitiful dispositions of his siblings, and resolves to shut them out of his life for good…or so he thinks. That same evening, a band of warriors of a dark race invade his home, kidnapping John’s siblings…and leaving him to bleed out on the floor of his own house. But John is not undone so easily. Compelled by his own hatred of the warriors that left him to die, and a sense of duty towards his siblings, John sets out on a quest for vengeance. Joining him is Faith Pinck, a caring, innocent girl who doesn’t yet understand the true motives behind John’s desire to track the evil band of warriors. And in the midst of their adventures as they journey to rescue John’s siblings, they begin to uncover a deeper, darker plot that will endeavor to collide the world of humanity with the world of an unholy, malicious, supernatural being. I hope you love what you read! Thank you for all of your support. I couldn’t do this without you. Interested in downloading a copy? Volume 1 is free! Feel free to click the picture of Volume 1 in the sidebar or just click here. Volume 1 is also free on iBooks, Kobo, or as a Nook Book! I promise you won’t be disappointed! ALSO: Volume 4 is still free, and the discount for Volumes 2 and 3 continues! Click here to check them out! Well, I said it would be happening. In light of finishing the first story arc of The Golden Lands, lots of renovations are being made in order to improve my series as a whole! With Volume 4 having been finished, there is cause for some celebration…and part of that includes making sure that Volume 3 got a cover it deserved. A little vague, a little obscure…perhaps a little unprofessional. And here’s what it looks like now!!!!!! For those of you that are die-hard TGL fans, can you guess who that is??? (P.S. my mega-sale still continues! Volume 1 (click here) is free, as is Volume 4 (click here). Also, Volumes 2 (click here) and 3 (click here) have been lowered to $0.99 from $2.00). DON’T MISS OUT! Or at least that’s what the stories say. I’ve never found “him” in all my childhood years. I’m not so sure if I believe in “him” anymore. In a small house near the edge of a wood, looking out into a grassy plain, lives a humble family; me, my sister, and my brother, both of which are younger than me. I love them; I just don’t know them. We have never been close, not because we don’t get along, but because we are often separated. For years, ever since our parents disappeared, I have spent my time scouring the woods every day, searching for food, gathering firewood, doing everything I can to keep them alive. I don’t know them, and they don’t know me, but I care for them. Sometimes, I feel like they don’t know that they’re dying, that without the meager care I give them, things would grow worse. It’s hard to imagine worse. With only me to provide for them, I don’t know how else they would survive. But “he” has always existed. My parents used to tell me of “him”. They said “he” was a great warrior—a wielder of strange, mystical powers. His sword flashed quicker than lightning, they told me, and his strength was mightier than a giant’s, and his endurance could not be matched. And they said that, in difficult times, “he” would keep me going. “He” would help me fight through my trials. “He” aided all. “He” was a lender of inner, mystical strength. That’s what my parents said. That was before they disappeared. I wish I knew more about who “he” was. But I don’t. As the days go by, I want to travel the large, beautiful forests and the wide, windy plains, and look for “him”. I could use “his” help. But I can’t—I can’t go in search of “him”. My brother and sister wouldn’t be able to survive on their own. My parents always said that there was Evil in these lands. It came from afar, not from the Golden Lands, but elsewhere. They said that it would find us; all of us. We had to be careful, they would say—there was evil in all of us. Maybe that’s why I’ve never seen “him”. Maybe I can’t see “him” because of the Evil. Or maybe not seeing “him” is the Evil. But then it came. Like my parents said, Evil would find us. It only seeks to grow, they said. The evil inside of us, it beckons to more evil. If we do not defeat the evil inside us, then we might as well let Evil walk right through our door. If we do not cast out darkness, then it will only grow inside of us. And once it does that, it will consume those around us. The day I forgot this advice will be the day I will never forget. Click here to preview further and download The Golden Lands, Volume 1 for free!!! …if you’re wearing socks, of course. Interested in my series? Click here to check out Volume 1! Once again, thank you all for the support! I couldn’t do this without you.